Prominent & Leading Manufacturer from Ahmedabad, we offer cooling tower repairing service. 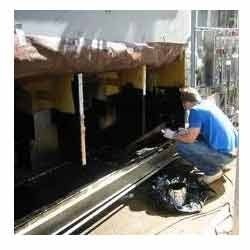 Cooling Tower Repairing Service offeredis handled by experienced professionals from the industry who hold expertise in flawlessly carrying out associated repair and maintenance tasks and are ready to provide prompt assistance to any industrial cooling tower repair/maintenance requirements. The team’s extensive experience in field of cooling tower repairs including of all makes and models like Counterflow, Crossflow, Natural Draft, Fin Fan as well as support of genuine quality tested components ensures flawless functioning of these towers. Looking for Cooling Tower Repairing Service ?